“Higher than mountains, deeper than oceans, stronger than steel and sweeter than honey” is a popular slogan used by Beijing and Islamabad to describe diplomatic relations between China and Pakistan. China, however, seeks to go beyond the state-to-state relations by reaching the hearts of the people in Pakistan–a country that is central to its mega Belt and Road Initiative (BRI) through the China-Pakistan Economic Corridor (CPEC). Since the start of the CPEC, China has invested heavily in public diplomacy to promote its goodwill in Pakistan. Through analysis of the CPEC in the Twittersphere, we argue that official sources representing China and Pakistan have been using Twitter as a tool to promote positive aspects of the CPEC. The ubiquity of the Internet and the immediacy of social media have made it more difficult for countries to use public diplomacy to manage international public opinion. Public diplomacy is about an ability to frame desirable reality, and the projection of reality is easier with traditional media because the number of actors to engage with passive audiences are limited. Social media, on the other hand, breaks the limitation as it encompasses elements such as citizen journalism, participatory media and user-generated content. Now, anyone can be an actor to engage with active audiences. A message can be defined and debated, which means it is unpredictable, and the online audience has shown to be opinionated, volatile and powerful. In the social media sphere, governments may have lost their positions as the primary architects of grand narratives, but many governments are catching up to gain more prominence in social media. Considering the scope of this article, we focus on Twitter. In a transnational public sphere called the Twittersphere, there are numerous actors including foreign governments, media outlets and ordinary citizens who compete to be the narrators of CPEC stories. It is not just because of the geopolitical and geo-economic competition between the U.S. and China, but also because of the nature of the CPEC, which makes it controversial even within South Asia. India is the most prominent actor in South Asia and naturally views the CPEC with skepticism. Through analysis of tweets on the CPEC, we aim to understand the overall sentiment about China’s BRI project in Pakistan. The data was collected for the period between January 2015 and October 2018. Foreign publics control country reputations, not the country itself. Out of 46 months, positive percentage outweighed neutral percentage in 37 months. This can be seen through the data shown in the image below. The number of tweets tended to rise in any month that a CPEC-related event occurred, such a summit and expo in August 2016 and the May 2017 Belt and Road Summit in China. The Expo in August 2016, which was held at the Pakistan-China Friendship Centre, was aimed at promoting CPEC awareness, as well as celebrating the signing of a $46 billion CPEC program. Back then, Pakistani Prime Minister Muhammad Nawaz Sharif announced that the real value of CPEC was long lasting and much higher than $46 billion. The Belt and Road Summit also played a crucial role in generating a national consensus in Pakistan, as the chief ministers of the country’s four provinces accompanied the PM. The top five Twitter accounts that posted the most over a 46 month-period are either “Pakistani” personal or institutional Twitter accounts: Pakistan-China Institute (@CPEC_Official), Ministry of Planning, Development, Reform of Pakistan (@PlanComPakistan), Amjad Farooq Ch. (@CPEC15), Pakistan Broadcasting Corporation (@RadioPakistan) and Ahsan Iqbal (@better_pak). It is important to mention that the most prominent accounts belong to either Pakistani ministries directly dealing with the CPEC, such as the Ministry of Planning, Development and Reform, or relevant officials, such as the former minister Ahsan Iqbal. These accounts actively constructed the image of CPEC in the Twittersphere due to their volume of tweeting. Furthermore, social media success and effectiveness are also measured by engagement such as retweets and likes. A retweet is a mechanism to extend an idea beyond the direct followers of a tweet owner, and a retweet is an act of endorsement. Four of the top five tweets that were retweeted the most are from Pakistani personal accounts. They are the accounts of an activist (@Arslan_Sadiq), an anchorperson (@ARYSabirShakir), a TV journalist Kamran Khan of Geo TV (@AajKamranKhan) and a spokesperson of Pakistani military media wing (@OfficialDGISPR). The remaining one is a Twitter account of New Delhi Times (@NewDelhiTimes) from India. The number of likes is a direct reflection of preferences or a user that shares the same opinion with a tweet. 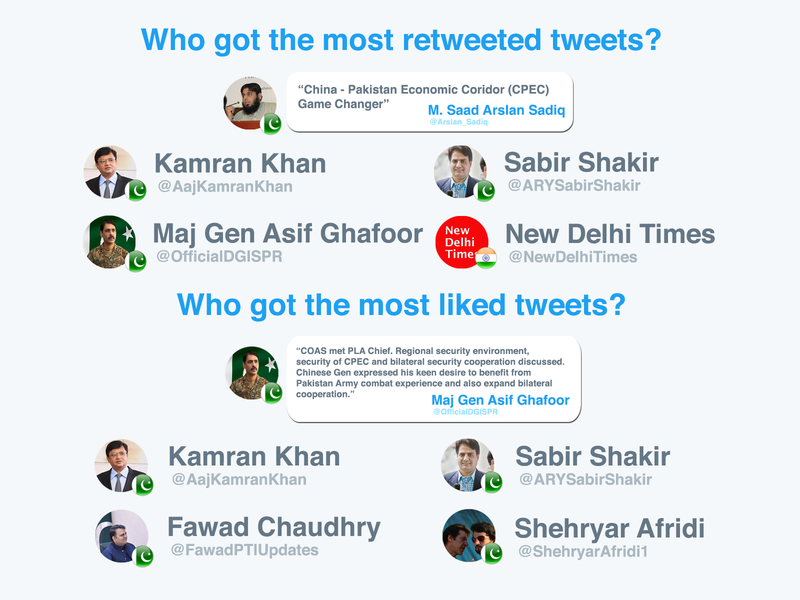 The five tweets that got liked the most are all from Pakistani personal Twitter accounts of Kamran Khan (@AajKamranKhan), Major General Asif Ghafoor (@OfficialDGISPR), Sabir Shakir (@ARYSabirShakir), Fawad Hussain Chaudhry, who is the current Federal Minister for Information (@fawadchaudhry), and Shehryar Khan Afridi who is the current Minister of State for Interior (@ShehryarAfridi1). Many studies have shown that China has extended its efforts to promote the country’s reputation in many parts of the world, but that it still lags behind in its public diplomacy especially in social media diplomacy. Although China has invested tremendous resources on the construction of CPEC projects, it has not paid as much attention to how the CPEC looks on the Twittersphere. However, the sentiment has been satisfactory, and it is not the result of Chinese social media diplomacy. The effort that China put in the CPEC is sufficient, and the extra effort for social media diplomacy is not necessary. Twitter accounts that actively feed CPEC stories and engage are from “Pakistani” sides, so it has been almost effortless for China because China is not the primary author of CPEC narratives. For China, it is a great success that some key officials and government institutions are promoting China’s goodwill through Twitter and other mediums. The Chinese officials in Islamabad have been actively using Twitter and other media outlets to promote China’s image in Pakistan, but it doesn’t seem that they are overdoing it, as their accounts are not the top ones tweeting about the CPEC. Nevertheless, no country can control its reputation. A country only has the perception of control because it does not hear negative words from people. While the country can motivate international audiences to talk about it positively, ultimately the audiences are the ones who control the message. Foreign publics control country reputations, not the country itself. In this case, China’s reputation in the context of the CPEC appears to reside in the positive region thanks to some key Pakistani officials and government offices.